May 18, 2010 - Two Lockheed Martin F-35A Lightning II stealth fighters flew nonstop from their final-assembly site in Fort Worth, Texas, to Edwards Air Force Base, Calif., signaling a further expansion of F-35 flight test operations. The arrival is the first in a series that will increase the Edwards F-35 test fleet to at least eight aircraft. 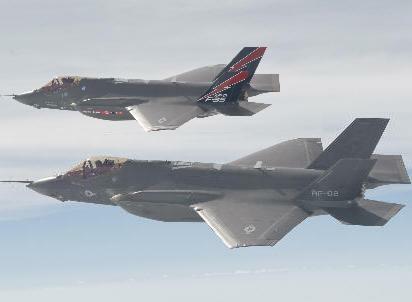 U.S. Air Force Test Pilot Lt. Col. Hank "Hog" Griffiths and Lockheed Martin Chief Test Pilot Jon Beesley flew the jets, known as AF-1 and AF-2, nonstop in the first multi-ship, long-range F-35 flight. "The ferry flight went very smoothly, and reflects how the Air Force and Lockheed Martin will work cooperatively as we enter long-term F-35 testing at Edwards," Beesley said. During the jets' deployment to Edwards, the F-35s will undergo ground- and flight-test activities for propulsion, aerial refueling, logistical support, weapons integration and flight-envelope expansion. "Through rigorous flight testing we are developing dominant and lethal 5th generation fighter capability for America and her allies," said Doug Pearson, Lockheed Martin vice president of F-35 test and verification. "This historic moment at Edwards Air Force Base begins the planned expansion of F-35 flight test to a third permanent operating location. Lockheed Martin F-35A flight testing is a highly integrated partnership with the United States Air Force." Three F-35s are currently undergoing flight trials at Naval Air Station Patuxent River, Md., the primary test site for the F-35B short takeoff/ vertical landing variant and the F-35C carrier variant. F-35s have conducted more than 200 test flights, with six additional test aircraft scheduled to begin flying and deploying to the two test sites this year. The F-35A conventional takeoff and landing (CTOL) variant – designed to meet U.S. Air Force requirements – is also the primary export version of the Lightning II. The air forces of Italy, the Netherlands, Turkey, Canada, Australia, Denmark and Norway will employ the F-35A.